Britain’s betting industry is bracing for the release of a government review into controversial fixed-odds betting terminals (FOBTs). 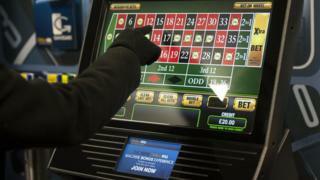 Punters can stake up to £100 per spin on the machines, leading critics to dub them the “crack cocaine of gambling”. They generated more than £1.8bn in revenue for bookmakers last year. This week the Department for Digital, Culture, Media and Sport announces the findings of its review into whether FOBTs cause harm to gamblers. It will also begin a 12-week consultation that will guide its ultimate decision on the issue. The review has some industry figures worried because it could recommend maximum bets be cut from £100 to just £2. It may also push for gambling companies to fund an industry awareness campaign and more training for its staff. So what would a cut mean for the industry? Gambling machines have been a regular sight in pubs, clubs and cafes for decades. But when FOBTs hit the high street at the turn of the millennium they offered something new: computerised casino games such as roulette and blackjack at the touch of a button. FOBTs are found in both casinos and betting shops in the UK, but are much more common in the latter. Each machine accepts bets up to a pre-set maximum and pays out according to fixed odds on the simulated outcomes of games. Two categories of games are available. B3 games have a maximum stake of £2 and a maximum prize of £500. The more contentious B2 games allow for bets of up to £100 with the potential for the same-sized prize. The spins in a game can come as often as every 20 seconds. Initially a small number of high-margin games were available, but changes to tax laws in 2001 allowed the industry to introduce lower-margin games to FOBTs – sending their numbers skyrocketing. By April 2005 an estimated 20,000 terminals were in use and more than 34,000 are now found across the UK, according to the Gambling Commission. The UK is unusual in allowing gamblers to stake as much as £100 a spin on gambling machines and they’re proving highly profitable for the industry. The latest Gambling Commission figures show machine numbers fell by 0.6% between April 2015 and March 2016. However, revenues from FOBTs increased by 3.3% during the same period to more than 1.8bn – a 70% increase compared with April 2008. The growth has been fuelled demand for new machines. Sales of B2 machines climbed from about 1,500 five years ago to more than 2,600 last year. These numbers are also boosted by gambling outfits looking to replace machines broken by angry punters. How would cuts affect the industry? Several options are on the table. The government may reduce maximum bets to £50; between £10 and £30; or even as low as £2. Labour and the Liberal Democrats have both expressed support for a £2 stake – as have many local councils. A spokesperson for the Association of British Bookkeepers (ABB), the betting industry body, declined to comment but it has vocally opposed cuts in the past. The association has suggested a £2 stake could lead to 20,000 job losses, the closure of thousands of betting shops and millions in lost tax revenue. The machines brought in more than £400m in tax revenue last year, according to some industry estimates. The horseracing industry, which receives sponsorship money and levy funding from betting firms, could also be affected. But in a recent report, Barclays analysts said “the market is pricing in a worst case scenario: we think a more ‘benign’ outcome is more likely”. Some within the gambling industry even agree, although bingo and arcade operators, which are not allowed FOBTs, would like to see the the stakes reduced on the machines. The British Amusement Catering Trade Association, or Bacta, supports a “substantial reduction” in maximum bets but has not suggested by how much. The industry body, which represents bingo and arcade operators, has also suggested that no betting shops would be forced to close even if the betting cap were lowered to £20. “I don’t think it’ll be as catastrophic as has been suggested by the bookmaking industry,” said Bacta chief executive John White. The ABB has hit back at groups such as Bacta, saying they are simply trying to protect profits. Whatever their motives, the stakes have never been higher for the betting industry.